I have totally been rushed off my feet the last two weeks between my boyfriends birthday and my accounting and finance module starting this week. I hope you have all been keeping well ? I know I haven't posted for around 4/5 days now, so I thought I would talk about my favourite beauty topic "Lippies". I must admit in the summer I am a total Peach girl, I think Peach is so beautiful in the summer and it really adds a gorgeous warmth to the skin. However, come Winter I obsess over Blue Toned Pinks and turn total ice queen ;) haha!. There is something about Pink on lips/cheeks in Winter that I find so beautiful... do you agree ? If you are visiting my blog via the #bbloggers chat then I would like to say a big warm welcome to my little Pink blog haha :) - You can also contact me via twitter "Jewelbeautyblog"
This has been by far my most used lip product over the last two weeks. I absolutely love this gloss because it gives me a gorgeous Pink Colour with the perfect amount of Colour pay off for everyday. I also quite like the texture, and find it quite easy to wear and re-apply. It does have quite good lasting power for a gloss, and probably lasts around 2 hours on me. Say hello to my ultimate "Blue Toned Pink Lippie" - I absolutely love this lipstick for so so many reasons (cough *beautiful packaging* cough) and of course the product itself. It is very similar to MAC "Going Casual" but it does give quite opaque coverage, so I tend to go for the MAC gloss if I want the same Colour but just not as strong. I would say this is one of my top ever lip products, because it looks amazing with a smokey eye. This is possibly the most unique formula that I have ever used. It it the perfect combination of gloss, stain and lipstick all in one. It's not only that fact which makes it ahh mazing! - It also has the texture of all three, which may sound weird.. but you would have to try it to know what I mean haha. The glossy stain can also build up different coverage, which actually makes it quite a versatile product. However, the shade 18 is a very light milky blue toned Pink, which does make it slightly harder to wear, especially if your lips are chapped. Demure is a pale toned milky Pink with Blue iridescent sparkle, which I think is really pretty. 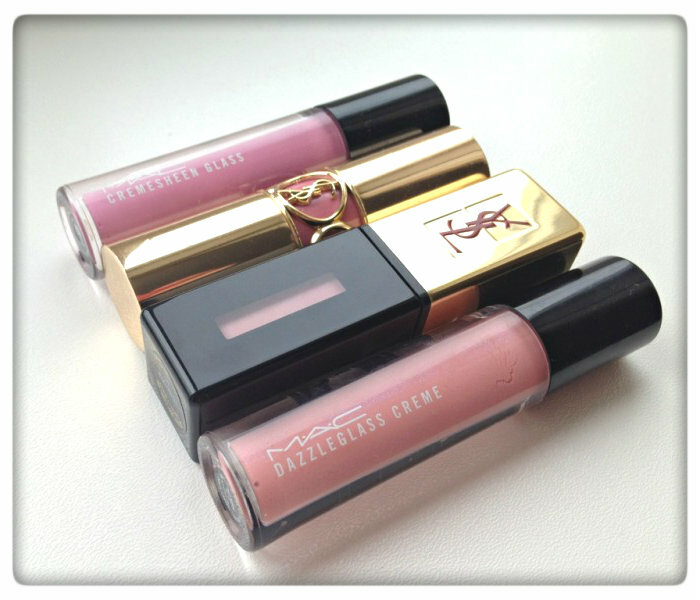 Both MAC "Demure" and "Going Casual" come part of the Lavish Rose collection, so I'm not sure if you can buy these alone?. I am using "Going Casual" more right now, but after swatching and seeing the beautiful Sparkle.. I think "Demure" is going to be another favourite!. 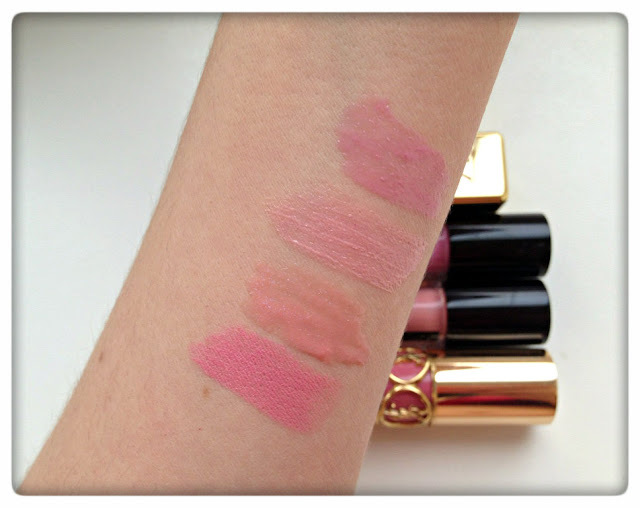 Thank you for reading :) - I would love to know what your favourite shades are from this post ? I love pink lipglosses and lipsticks but I haven't find the perfect peach color for me .-. My name is Valentina and I'm a passionate graphic designer. I wonder if you would be interested in a new layout for your blog! You can visit mine to get a closer idea about me! And what do you have a very nice blog! I will certainly follow you now! I absolutely love MAC Going Out. I need to buy this! I sometimes find it difficult to find nice pink colours.